Roy, R.H. and Richard Foot. "Canada and the Battle of Passchendaele". The Canadian Encyclopedia, 08 November 2018, Historica Canada. https://www.thecanadianencyclopedia.ca/en/article/battle-of-passchendaele. Accessed 18 April 2019. The Battle of Passchendaele, also known as the Third Battle of Ypres, was fought during the First World War from 31 July to 10 November 1917. The battle took place on the Ypres salient on the Western Front, in Belgium, where German and Allied armies had been deadlocked for three years. On 31 July, the British began a new offensive, attempting to break through German lines by capturing a ridge near the ruined village of Passchendaele. After British, Australian and New Zealand troops launched failed assaults, the Canadian Corps joined the battle on 26 October. The Canadians captured the ridge on 6 November, despite heavy rain and shelling that turned the battlefield into a quagmire. Nearly 16,000 Canadians were killed or wounded. The Battle of Passchendaele did nothing to help the Allied effort and became a symbol of the senseless slaughter of the First World War. 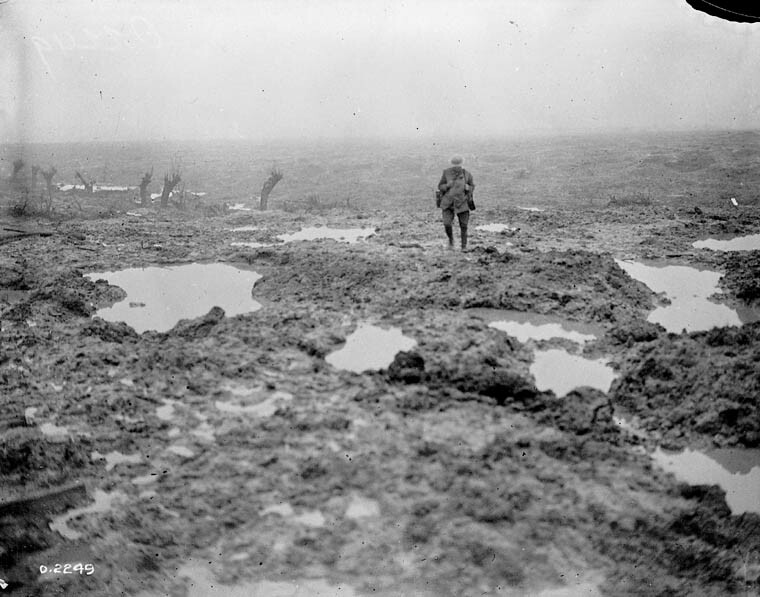 A Canadian soldier walks across the blasted, mud-soaked Passchendaele battlefield during the First World War in 1917. By the spring of 1917, the Germans had begun unrestricted submarine warfare — sinking Allied merchant ships in international waters. Although the attacks had brought the United States into the war on the Allied side, they threatened the shipping routes that carried war supplies, food and other goods into Britain. British naval leaders urged their government to force the Germans from occupied ports on the Belgian coast, which were being used as enemy submarine bases. General Douglas Haig, commander of the British armies in Europe, said that if the Allies could break through the German front lines in Belgium, they could advance to the coast and liberate the ports. At about the same time, legions of French soldiers, weary from years of grinding war, had begun to mutiny following the failure of a large French offensive on the Western Front. With some French armies temporarily unwilling or unable to fight, General Haig also believed that an aggressive British campaign in the summer of 1917 would draw German resources and attention away from the French forces, giving them time to recoup and reorganize. Haig proposed a major offensive in the Ypres salient, a long-held bulge in the Allied front lines in the Flanders region of Belgium. The salient had been an active battlefield since 1914, and Canadian troops had fought there in 1915 (see Second Battle of Ypres). 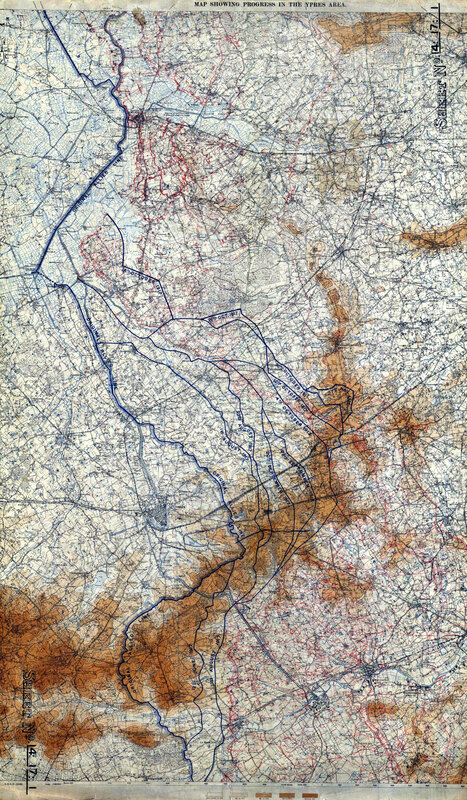 Haig argued that capturing the plateau overlooking the salient — including Passchendaele ridge and the crossroads village of the same name — would provide a suitable jumping-off point for Allied forces to advance to the Belgian coast. In military terms, a salient is a bulge in a battlefield front line that opens into enemy territory. The Ypres salient was a bulge in the front lines on the Flanders plain, east of the Belgian city of Ypres. The salient was a dangerous place for Allied defenders because it was surrounded on three sides by enemy soldiers and artillery. 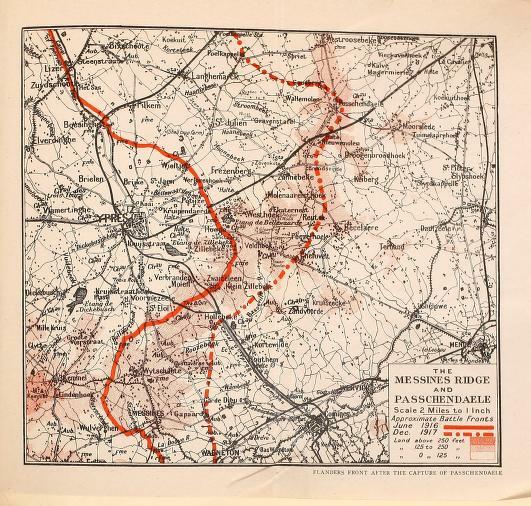 Map showing progress in the Ypres area, 1 Aug to 17 Nov, 1917. 8th edition. GSGS 3588. 1:40,000. War Office. British Prime Minister David Lloyd George was skeptical of Haig’s scheme. Britain only had a small superiority in forces over the enemy. Even if German lines could be broken at Ypres, the coastal ports might not be captured, and the offensive in Belgium wouldn’t end the war, in any case. The only certainty was heavy loss of life. Despite these fears, Haig’s plan was approved by the British war Cabinet. The Battle of Passchendaele, also known as the Third Battle of Ypres, would begin in July. The Canadian Corps, Canada’s 100,000-man assault force (see Canadian Expeditionary Force) was initially spared involvement in General Douglas Haig’s 1917 campaign. The Corps, fresh from its April victory at Vimy Ridge, was instead assigned the task of attacking Germans occupying the French city of Lens (see Battle for Hill 70) in the hopes that this would draw German resources away from the main battle in the Ypres salient. In mid-July, as the Canadians prepared to attack Lens, British artillery began a two-week bombardment of a series of scarcely visible ridges rising gently around the salient, on which the Germans waited. Previous fighting since 1914 had already turned the area into a barren plain, devoid of trees or vegetation, pockmarked by shell craters. Earlier battles had also destroyed the ancient Flanders drainage system that once channelled rainwater away from the fields. The explosion of millions more shells in the new offensive — accompanied by torrential rain — quickly turned the battlefield into a swampy, pulverized mire, dotted with water-filled craters deep enough to drown a man, all made worse by the churned-up graves of soldiers killed in earlier fighting. 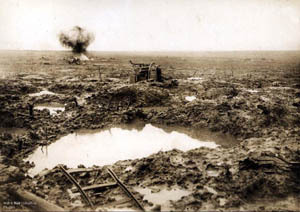 The mud-soaked battlefield at Passchendaele, Belgium, in the fall of 1917. British troops, supported by dozens of tanks (seeArmaments) and assisted by a French contingent, assaulted German trenches on 31 July. For the next month, hundreds of thousands of soldiers on opposing sides attacked and counterattacked across sodden, porridge-like mud, in an open, grey landscape almost empty of buildings or natural cover, all under the relentless, harrowing rain of exploding shells, flying shrapnel and machine-gun fire. Few gains were made. Nearly 70,000 men from some of Britain’s best assault divisions were killed or wounded. By early September, Haig was under political pressure from London to halt the offensive, but he refused. In September, Australian and New Zealand (ANZAC) divisions were thrown into the fight alongside the worn out British forces. Despite some limited gains, the result was mostly the same: the Allies would bombard, assault and occupy a section of enemy ground only to be thrown back by the counterattacking Germans. Haig was determined to carry on despite the depletion of his armies and the sacrifice of his soldiers. In October, he turned to the Canadians. 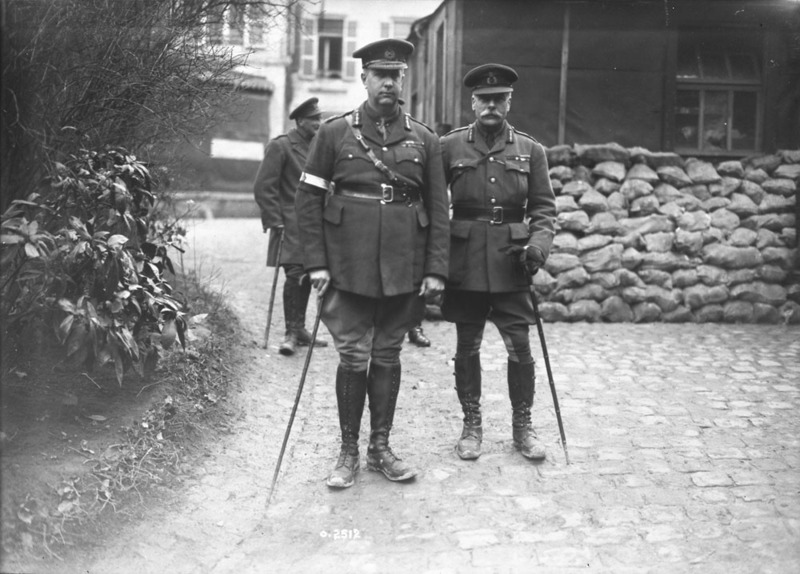 General Douglas Haig ordered Lieutenant General Arthur Currie, the Canadian Corps’	new commander, to bring his four divisions to Belgium and take up the fight around the village of Passchendaele. Currie objected to what he considered a reckless attack, arguing it would cost about 16,000 Canadian casualties for no great strategic gain. Ultimately, however, Currie had little choice. After lodging his protest, he made careful plans for the Canadians’ assault. Over the next two weeks, Currie ordered the removal of the dead, and the building and repair of roads and tramlines to help in the movement of men, armaments and other supplies on the battlefield. Even so, transporting troops to the front lines from which they would launch their attack was a treacherous business. The battlefield was a vast expanse of mud, riddled with water-filled shell craters. Soldiers and pack animals had to pick their way across narrow “duck walk” tracks that wound among the craters. Slipping off the tracks carried the risk of drowning in craters big enough to swallow a house. Amid these conditions, troops and officers were given time to position themselves and prepare for the attack, which opened on 26 October. For the next two weeks, all four divisions of the Canadian Corps took turns assaulting Passchendaele ridge in four separate attacks. During the first two — on 26 and 30 October — Canadian gains measured only a few hundred metres each day, despite heavy losses. So fierce was the fighting that one battalion, the Princess Patricia’s Canadian Light Infantry, lost almost all its junior officers only an hour into the assault on 30 October. Under almost continuous rain and shellfire, conditions for the soldiers were horrifying. Troops huddled in shell holes, or became lost on the blasted mud-scape, not knowing where the front line was that separated Canadian from German positions. The mud gummed up rifle barrels and breeches, making them difficult to fire. It swallowed up soldiers as they slept. It slowed stretcher-bearers — wading waist-deep as they tried to carry wounded away from the fighting — to a crawl. Ironically, the mud also saved lives, cushioning many of the shells that landed, preventing their explosion. 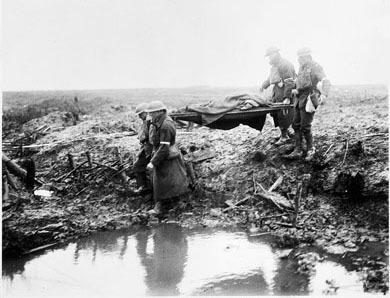 Soldiers carry a wounded Canadian to an aid-post during the Battle of Passchendaele, November 1917. 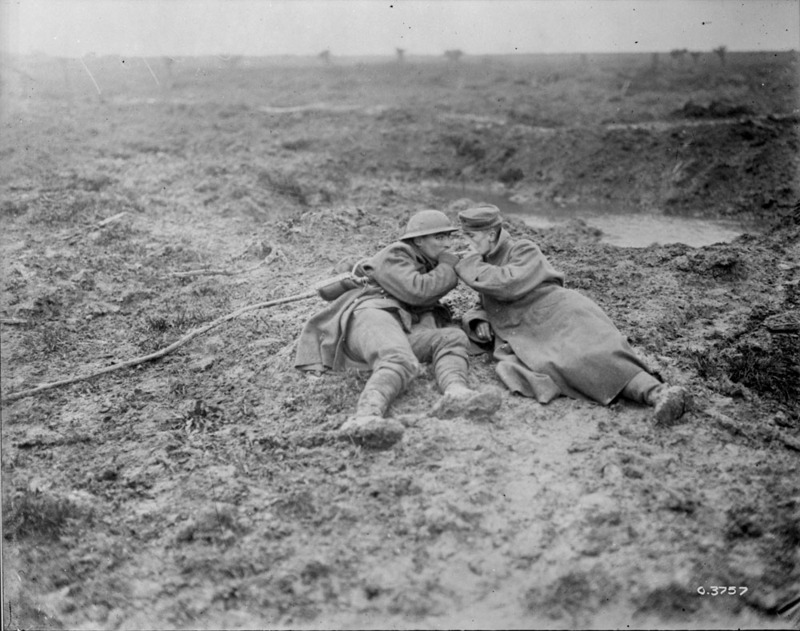 Two wounded First World War soldiers - a Canadian and a German - light cigarettes on the muddy Passchendaele battlefield in Belgium in 1917. 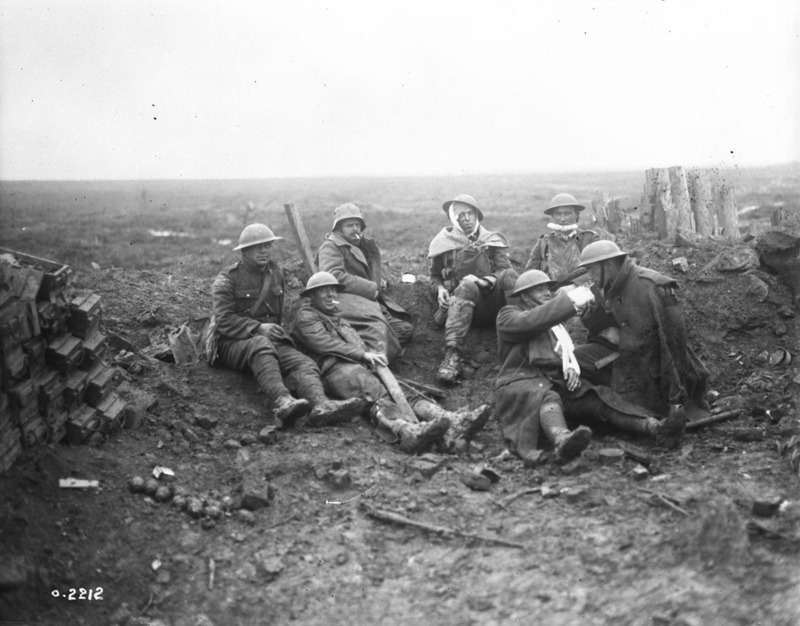 Canadian soldiers wounded during the Battle of Passchendaele, November, 1917. 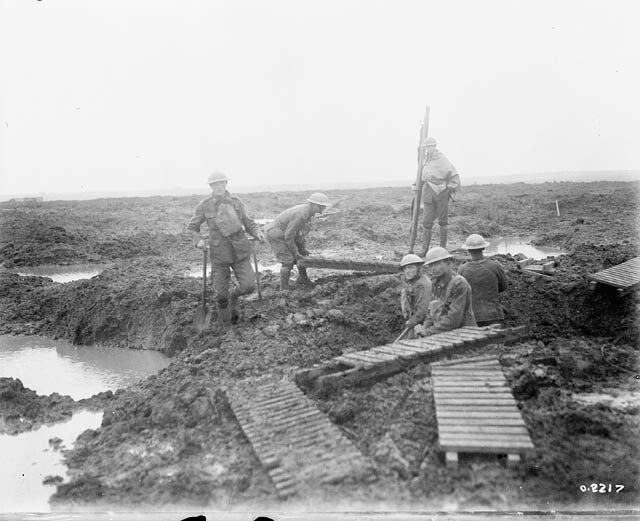 Laying trench mats over the mud during the Battle of Passchendaele, in Belgium, November, 1917. Was the Battle of Passchendaele a Success? On 6 November, the Canadians launched their third attack on the ridge. They succeeded in capturing it and the ruins of Passchendaele village from the exhausted German defenders. A fourth assault, which secured the remaining areas of high ground east of the Ypres salient, was carried out on 10 November — the final day of the more than four-month battle. Nine Victoria Crosses, the British Empire’s highest award for military valour, were awarded to Canadians after the fighting. 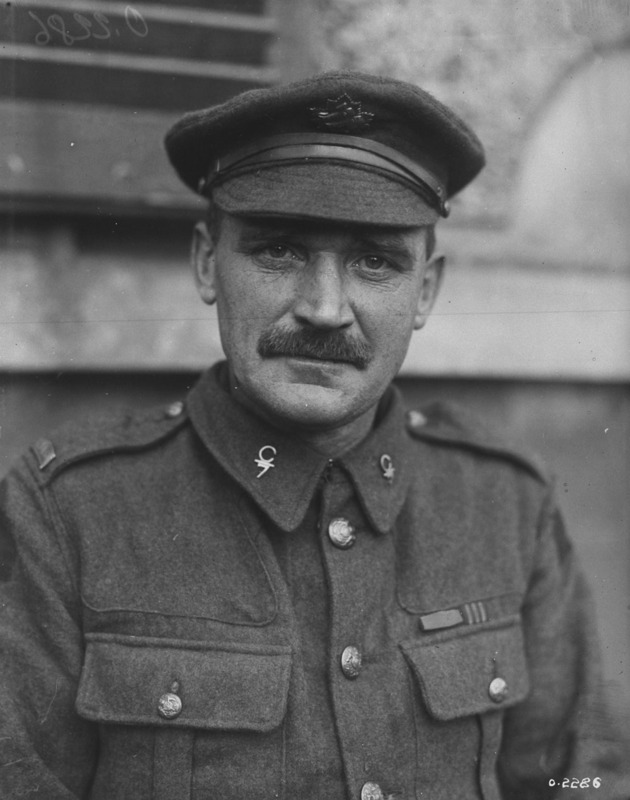 Among the recipients was Winnipeg’s Robert Shankland who on 26 October had led his platoon in capturing a series of German gun emplacements — and holding them against repeated enemy counterattacks — on a critical piece of high ground called the Bellevue Spur (see also George Randolph Pearkes). Corporal Francis Pegahmagabow, an Anishnaabe sniper from Parry Island reserve (now Wasauksing First Nation), won the first bar to his Military Medal for bravery at Passchendaele. 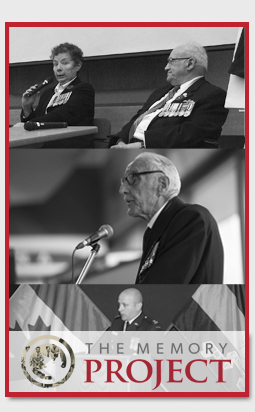 Pegahmagabow would become Canada’s most decorated Indigenous war veteran. An estimated 4,000 First Nations men enlisted in the First World War, but government records were incomplete and omitted non-Status Indians and Métis	people. More than 4,000 Canadians were killed and another 12,000 wounded — almost exactly the casualties predicted by Arthur Currie. These were among the 275,000 casualties (including 70,000 killed) lost overall to the armies under British command at Passchendaele. The Germans suffered another 220,000 killed and wounded. At the end, the point of it all was unclear. In 1918, all the ground gained there by the Allies was evacuated in the face of a looming German assault. A century later, the Battle of Passchendaele is remembered as a symbol of the worst horrors of the First World War, the sheer futility of much of the fighting, and the reckless disregard by some of the war’s senior leaders for the lives of the men under their command. The campaign was not followed by an advance to the coast and the liberation of Belgium’s coastal ports — partly due to the onset of winter, and partly because in the spring of 1918, the Germans launched a major offensive of their own. Although the fighting at Passchendaele did occupy and wear down German armies on the Western Front through the summer and fall of 1917 — perhaps diverting the enemy’s attention from the internal strife and weakness among French forces — it also depleted the British armies. Britain’s future wartime prime minister Winston Churchill called Passchendaele “a forlorn expenditure of valour and life without equal in futility.” A century later, Passchendaele remains one of the most controversial episodes of the war. 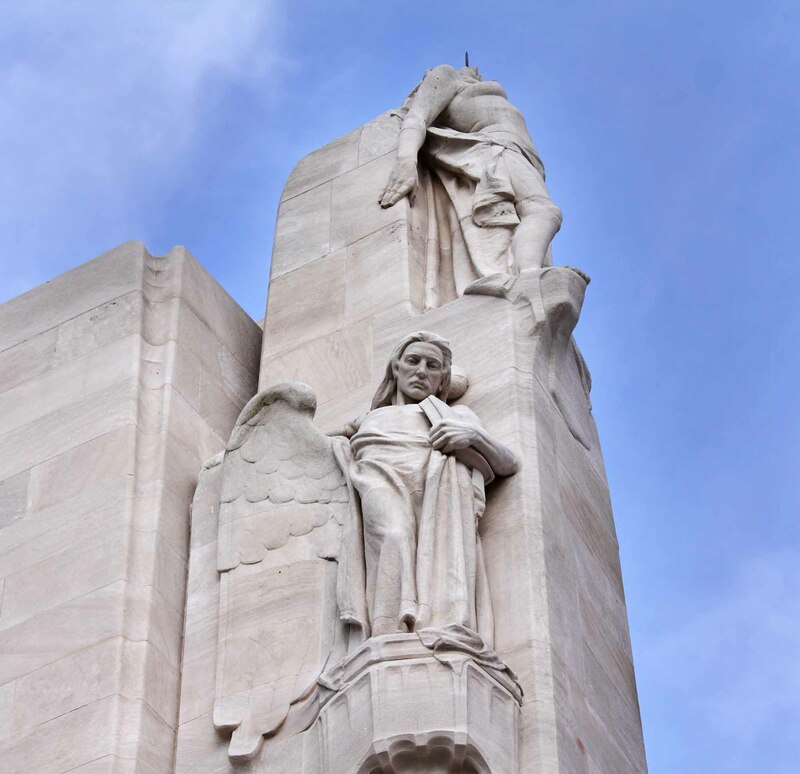 The sacrifice of Canadian soldiers in the battle is commemorated by the Canadian Passchendaele Memorial, located east of the city of Ypres (now called Ieper). The Canadians who died in the battle are buried and remembered at war cemeteries throughout the area, and also on the Menin Gate Memorial in Ypres, which is inscribed with the names of 6,940 Canadians who died throughout the war in Belgium, with no known graves (see Monuments of the First and Second World Wars). The graves of unknown Canadian soldiers who fought and died at the Battle of Passchendaele. These men were later buried nearby at the cemetary at Tyne Cot, Belgium. 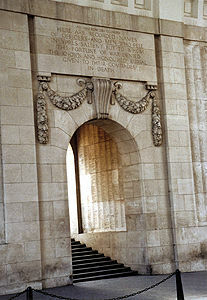 A detail of the Menin Gate memorial in Ypres (Ieper) Belgium, which is inscribed with the names of the 6,940 Canadians who died in Belgium during the First World War with no known graves. D.G. Dancocks, Legacy of Valour (1986). Tim Cook, Shock Troops: Canadians Fighting the Great War 1917-1918 Volume 2 (2009). Battle of PasschendaeleA detailed educational guide about the 1917 Battle of Passchendaele, a defining event in Canadian history. Associated with the major Canadian feature film "Passchendaele." From Historica Canada.